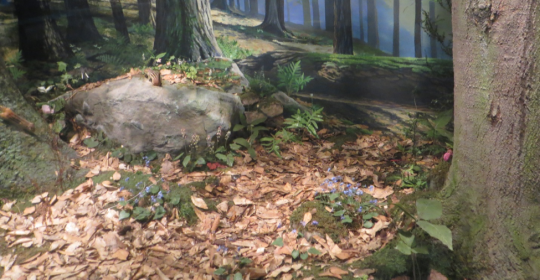 Within a Hall of Botany diorama depicting old growth Pennsylvania forest, a ferocious predator lurks amid dried oak, maple, and beech leaves. No snail, worm, or ground-dwelling insect is safe in the damp realm where this bright amphibian prowls. to see during a visit to a real old growth glen. At such a place, however, plenty of the eft’s near and distant salamander kin would almost certainly be lurking just out of sight. Pennsylvania supports 22 species of salamanders, the majority of which spend at least part of their lives foraging in habitat where trees, deep shade, damp leaf litter, loose soil, rotting logs, and mossy rocks occur. If the results of a 2014 University of Missouri study of salamander abundance in Ozark forests can be extrapolated to our region, the total biomass of salamanders inhabiting many wooded tracts rivals that of white-tailed deer. Because these salamanders eat invertebrates that eat leaf litter, the abundance of the tiny predators helps forests to be places where a portion of the carbon pulled from the atmosphere by trees is stored in leaf litter.